Maryland has surprisingly strict litter control laws that are designed to protect both public and private property. Everyone has seen the signs along the highway that threaten harsh fines for throwing trash out of a vehicle. If you receive a citation for littering on a state highway you will likely face a violation of the State Vehicle Laws. While this is not a moving violation, it is still something that could be a black mark upon a person’s traffic and or criminal record. It is important to retain a lawyer to challenge the citation rather than simply paying the fine and receiving a conviction. For an offense that does not carry jail time, our experienced traffic lawyers may be able to go to court and force the police officer to prove the offense at trial without our client having to show up to court. Even if the cop has sufficiently proved the offense, we may be able to argue for a reduced fine and possibly avoid a conviction. Littering can also be charged as a criminal offense, and depending on the amount of trash or debris alleged to have been left behind, this crime may carry a lengthy jail sentence. 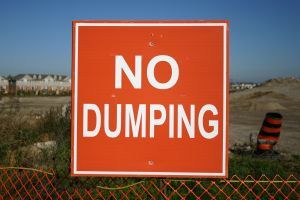 This crime, also known as illegal dumping, is often charged after an individual is stopped driving away from the scene of the dumping, or during the process of the dumping. In addition, many arrests are made after police conduct video surveillance and retrieve license plate numbers. If two or more people are stopped from littering from the same vehicle and it is not clear who committed the crime, the police will typically charge both parties. But the law is clear in saying that only the driver or the owner may be charged if there is insufficient evidence to point to one person. Benjamin Herbst has experience handling large scale littering cases, and is available at anytime to discuss the possible defenses that may be available to you in your case. Do not walk into the courtroom without an attorney to assist you in fighting the police and the state. The littler law is broken down into three different degrees with maximum punishments that depend on the weight or volume of the debris or trash. Dumping less than 100 pounds or 27 cubic feet has a maximum jail sentence of 30 days and a fine of $1,500. Between 100 and 500 pounds, or 27 to 216 cubic feet could result in a maximum jail sentence of 1 year and a hefty fine of $12,500. Finally, a conviction for littering more than 500 pounds or 216 cubic feet could result in up to 5 years in jail and a $30,000 fine. Any alleged dumping for commercial gain will also have the 5-year jail maximum and the highest fine. Each of these crimes is a misdemeanor, but as you can see the possible penalties are extremely serious. We are committed to exhausting every last effort in order to avoid a conviction, jail time, and fines for our clients. Contact the firm today to schedule a free consultation about your case. Our main office is in Baltimore City, but we are willing to travel to meet with you wherever it is convenient, even if you prefer to meet on a weekend.